Chemotactic migration and invasion play an essential role in many normal and pathological processes including immune response, cell differentiation, and tumor metastasis. Methods to study factors that regulate the directional migration of cells typically employ modifications of Boyden chamber assays. Boyden chamber assays consist of an upper and lower chamber separated by a porous filter, allowing for the diffusion of a chemotactic agent. Although these assays offer insight into the chemotactic response of cells, they have inherent drawbacks, including the inability to visualize active cell migration and the requirement for a large number of cells, typically 50,000 to 100,000 cells per well. This tutorial describes a novel technique for generating kinetic, image-based measurements of chemotaxis in a reproducible 96-well format, all while cells are maintained in physiologically relevant conditions inside a standard tissue culture incubator. The technique offers distinct advantages over Boyden chamber assays, including automated analysis, reduced cell requirement, the use of biologically relevant surface substrates, and the ability to observe cell morphology and movement of both adherent and nonadherent cells in mono- or co-culture, with or without fluorescent labels. The IncuCyte® ClearView chemotaxis cell migration assay (Essen BioScience) is conducted in a 96-well migration plate consisting of an optically clear membrane insert and reservoir that allows for direct visualization of cell migration and morphological changes using phase contrast and/or fluorescent imaging. The IncuCyte ClearView chemotaxis plate is placed in the IncuCyte instrument: a fully automated, live-cell analysis system with integrated image-analysis tools that is placed inside a standard tissue culture incubator. Integrated metrics precisely quantify the chemotactic response using 1,000 to 5,000 cells per well—a significant advantage when using rare, primary, hematopoietic cells from the blood. This assay method is sensitive to surface-integrin signaling, and sustains a linear gradient over several days. The result is 96 wells of reproducible kinetic data supported by images and movies, requiring very few cells and minimal hands-on time. Figure 1. Chemotaxis quantification. HT-1080 fibrosarcoma cells were plated in the top chamber of the IncuCyte® ClearView 96-well cell migration plate at a density of 1,000 cells/well. 10% FBS was added to the bottom chamber as a chemoattractant. Images represent the top and bottom sides of the membrane at the 36-hour time point. Automated image processing separates cells located on the top (outlined in yellow) and the bottom (outlined in blue) surface of the membrane. Pores are outlined in orange. Images are processed as they are acquired, and data can be plotted in real time. Whole-well images of cells on both the bottom and the top of the ClearView plate membrane are captured at user-defined intervals. All images are processed using automated algorithms to quantify cell area on each side of the membrane (Figure 1). Directed cell migration can be reported as either an increase in area on the bottom side of the membrane for adherent cells, or a decrease in area on the top side of the membrane for nonadherent cells that migrate down the pore and fall off of the membrane. 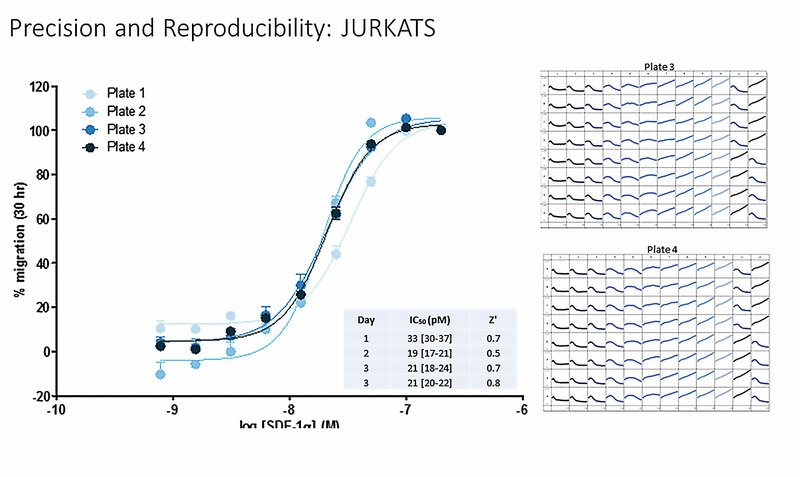 To assess assay reproducibility and precision of the chemotaxis cell migration assay, we performed a series of four independent experiments using Jurkat (nonadherent) T cells (Figure 2). Cells were plated at a density of 5,000 cells per well. Twofold dilutions of CXCL12 were made across columns, and measurements of total phase object area normalized to the initial value were plotted over a 30-hour time course. Highly reproducible well-to-well kinetic measurements, with an average intra-assay CV of 6.3%, were observed. Similar results were obtained when measuring the directed migration of HT-1080 cells toward FBS and neutrophils toward IL-8, C5a, and fMLP (data not shown). Figure 2. Precision and reproducibility of directed migration of Jurkat T cells toward CXCL12. Jurkat cells were plated at a density of 5,000 cells per well in the upper chamber of the ClearView cell-migration plate. Twofold dilutions of SDF-1a (n = 8 per concentration) were added to the reservoir. The low pore density of the ClearView membrane ensures that cells must migrate across the biologically relevant surface towards the chemoattractant. Neutrophils seeded on an uncoated ClearView membrane were unable to migrate toward the chemoattractants IL-8 and fMLP; however, those on Matrigel-coated membranes showed clear chemotactic profiles (data not shown). These data suggest that integrin and/or cell surface receptor interactions with the substrate play a key role in neutrophil chemotaxis in this model. We also observed that the assay micro-environment, specifically the type of albumin present in the assay media, is critical in supporting cell motility. Neutrophils suspended in RPMI supplemented with 0.5% BSA were unable to migrate toward C5a and IL-8 chemoattractant gradients. When media was supplemented with 0.5% HSA, however, neutrophils actively migrated toward both C5a and IL-8 (data not shown). Figure 3 shows that upon visual inspection of the wells, an observed difference in cell morphology of neutrophils isolated in RPMI + 0.5% BSA (rounded phenotype), compared to neutrophils isolated in RPMI + 0.5% HSA (activated phenotype). Together, these quantitative and qualitative data suggest that the interaction of cell integrins with the substrate and the overall assay micro-environment are a crucial component in the chemotaxis cell migration assay. Figure 3. Morphological images. Phase-contrast images of neutrophils isolated in RPMI + 0.5% BSA (left) versus isolation in RPMI + 0.5% HSA (right), seeded on ClearView membranes coated with 50 µg/mL Matrigel + 10% FBS, showing morphological differences in response to 1 µM C5a (t = 20 minutes). This difference in phenotype was also observed in neutrophils that were exposed to the chemoattractant IL-8. The IncuCyte chemotaxis assay is a quantitative and reproducible image-based approach for measuring chemotaxis in both adherent and nonadherent cell types, with fully automated quantification. This assay format allows for the kinetic detection of cell migration toward chemotactic gradients on a physiologically relevant substrate, with movies and images that support quantitative measurements and provide associated morphological and phenotypic insights. A sampling of recent publications demonstrates the use of this assay to study chemotaxis in immunology and oncology. A study by Pasqualon et al. demonstrated that syndecan-1, a surface-expressed proteoglycan on epithelial tumor cells, promotes macrophage migration inhibitory factor (MIF) binding and MIF-mediated cell migration. Invasion studies showed that MIF induced the chemotactic migration of A549 tumor cells, wound closure, and invasion into Matrigel without affecting cell proliferation. These MIF-induced responses were abrogated by silencing of syndecan-1. The authors conclude that this may represent a relevant mechanism through which MIF enhances tumor cell motility and metastasis. The tumor microenvironment and associated factors play an important role in metastatic capacity and drug resistance in pancreatic ductal adenocarcinoma. In a study by Smigiel et al., oncostatin M, a member of the IL-6 cytokine family, was identified as an important driver of mesenchymal and cancer stem cell (CSC) phenotypes. Generation of cells that harbor mesenchymal/CSC properties following exposure to oncostatin M resulted in enhanced tumorigenicity, increased metastasis, and resistance to gemcitabine, a chemotherapy drug used to treat pancreatic cancer. Lindy O’Clair (Lindy.Oclair@essenbio.com) is principal scientist, Clare Syzbut (Clare.Syzbut@essenbio.com) is senior research scientist, and Daniel M. Appledorn, Ph.D. (Daniel.Appledorn@essenbio.com), is director, U.S. Biology R&D, at Essen BioScience.